Torrentz.eu used to be one of the most popular websites in the world. Hundreds of thousands of searches were made every day, and it was the place to go to if you wanted to find any torrent file. Its content was gathered from major torrent websites, and each torrent had many trackers that helped you finish the download even when one was down. What made this site so famous was its simple design: all you had were a user menu and a search panel, and no registration was required to perform a search. Unfortunately, as many torrent indexing sites, it was targeted by anti-piracy organizations which constantly sued the website’s administrators. The battle was lost in August 2016, and the website shut down for good. Since then, many alternatives have tried to take its place. Some were short-lived, and others managed to stay online and become excellent places to search for all kind of stuff. In this list, we have gathered some of the top torrent websites, so take a look and see if any of them can fulfill your needs. 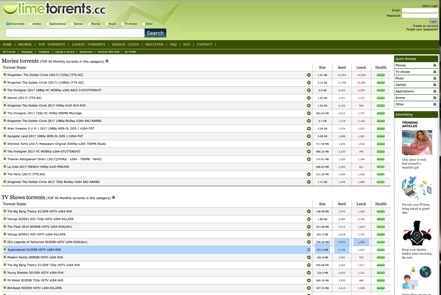 TreeTorrent is a site like Torrentz.eu that has an extensive database of torrents from around the world. Files are gathered from other site and indexed here, so you don’t have to visit other places. If you don’t know what to search for, there are three categories you can visit: New Torrents, Top Popularity, and Most Downloaded. Once you see what you want, click on the magnet link to open your torrent client and it will soon start to be transferred. Probably the best of the online torrent search engine sites like Torrentz.eu; few people haven’t heard about The Pirate Bay. Years have passed, battles have been fought, and the site is still online and working as the first day it was launched, way back in 2003. This in part has been made possible because it stopped hosting torrent files and now only offers magnet links. No matter what you need, be it a music file, video, e-book or document, if it is not available here it probably won’t be anywhere else. Like movies? One of the best torrent websites like Torrentz.eu is Torrentking. There are currently over half a million movies indexed, and hundreds more are added every day. You can search by title and genre, and sort the results by year of release. Each film has a summary and info about the cast, director, and IMDB link. Just make sure to have your popup blocker ready to get rid of those pesky ads. Limetorrents have managed to survive for a long time. Most of the indexed torrents are verified, and you can narrow down your search into a few categories: anime, applications, games, movies, music, and TV shows. This site is one of the big ones, with over 1.4 million videos and 700,000 application torrents indexed. Take a look at the Search Cloud page and see what other visitors have been searching for. Every result is a link, so just click on what catches your eye and you will be sent to the proper page to download the torrent. Few of the sites similar to Torrentz.eu were as well-known as this one. In 2014 it was even more popular than The Pirate Bay, according to the site’s Alexa’s ranking. It was visited by more than a million users each day, and it was the place to go to for any file or document you needed. As with most Torrentz.EU alternatives, it had to fight against anti-piracy organizations and was shut down in 2016. A few months later it was revived at its current domain and is slowly gaining traction to become what it once was. At this Torrentz.eu alternative you can browse, search, download and upload all kinds of torrents, but the entertainment category is the most popular one. Files are rated by the community so you can check before downloading. This saves you from picking files that are fakes or poorly encoded. Just make sure to visit the original site, there are many clones that ask you to download some program to gain access to the website, but these files can harm your computer and are not recommended. If the site doesn’t load, just move on to another alternative in this list.